My family travels a lot--as a family. Therefore, we must eat out a lot--as a family. With one picky eater in our midst--and two adults who prefer small local restaurants over large chains; dining out is out is not all fun and games. 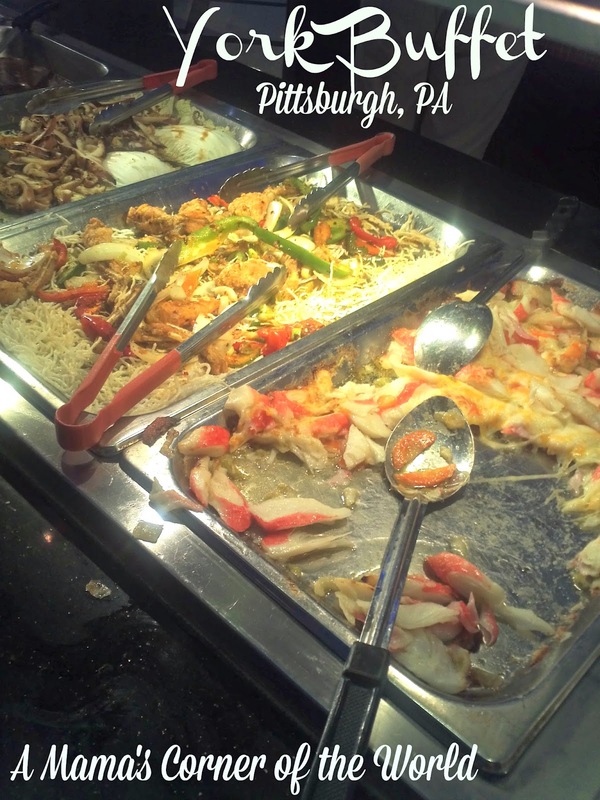 On a recent trip to Pittsburgh, we decided to skip the chains and visit a local Asian Sushi/Grill/Buffet spot: York Buffet near the Robinson Mall. My husband loves seafood and Asian flavors. I love Asian food...and tolerate seafood...but generally avoid buffet style dining. The youngest loves seafood...but, not Asian foods. The middle daughter hates seafood and will pretty much only eat lo mein noodles from one certain Chinese restaurant in town....but, pizza and chicken offer her safety nets. 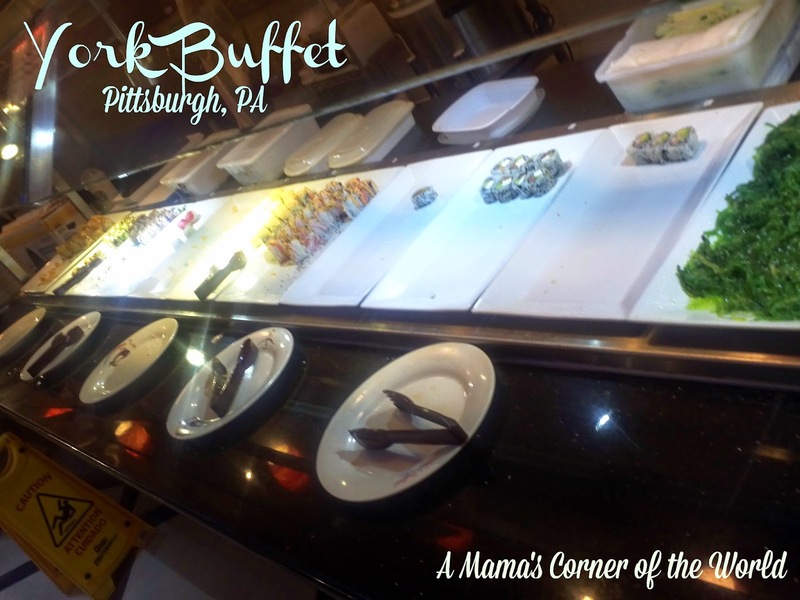 The menu for the York Buffet seemed to offer a family friendly mix of buffet food ranging from sushi and frog legs to prime rib and lamb to General Tso's chicken and pizza. 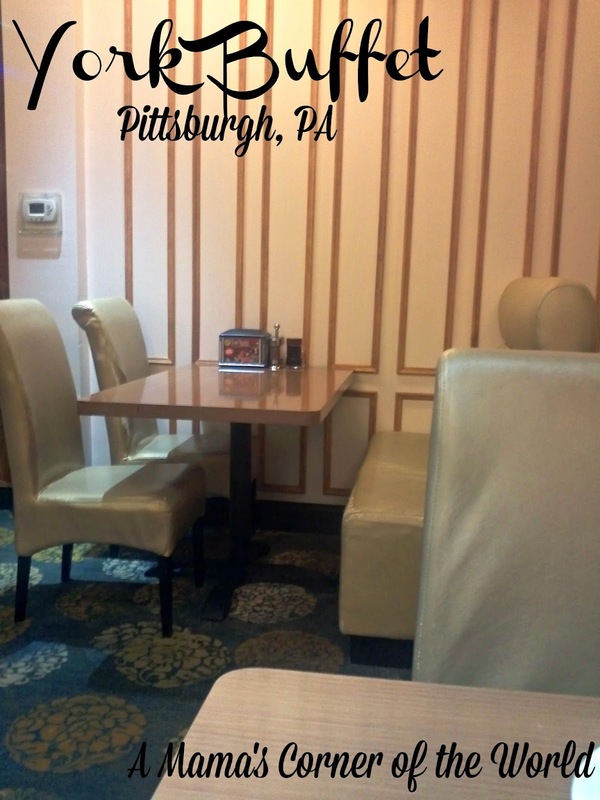 How did York Buffet in Pittsburgh, PA stand-up to our review? 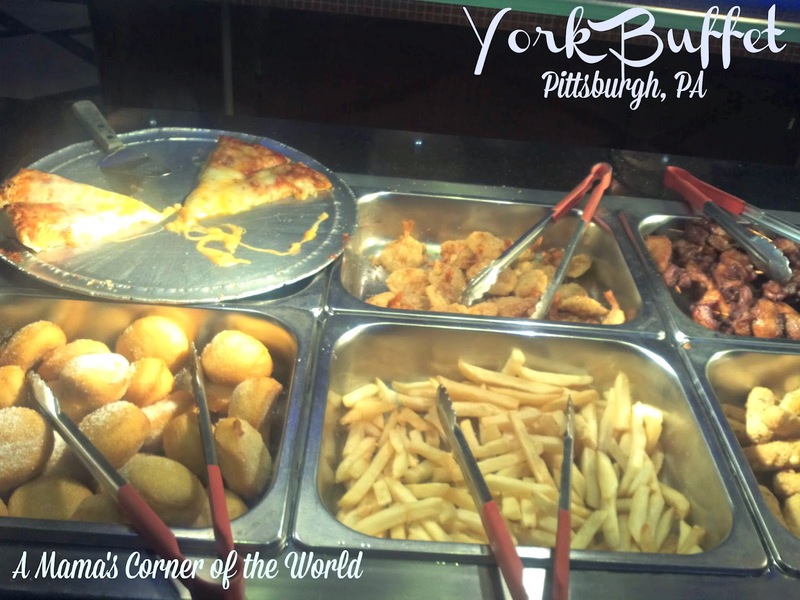 York Buffet makes great use of the location. 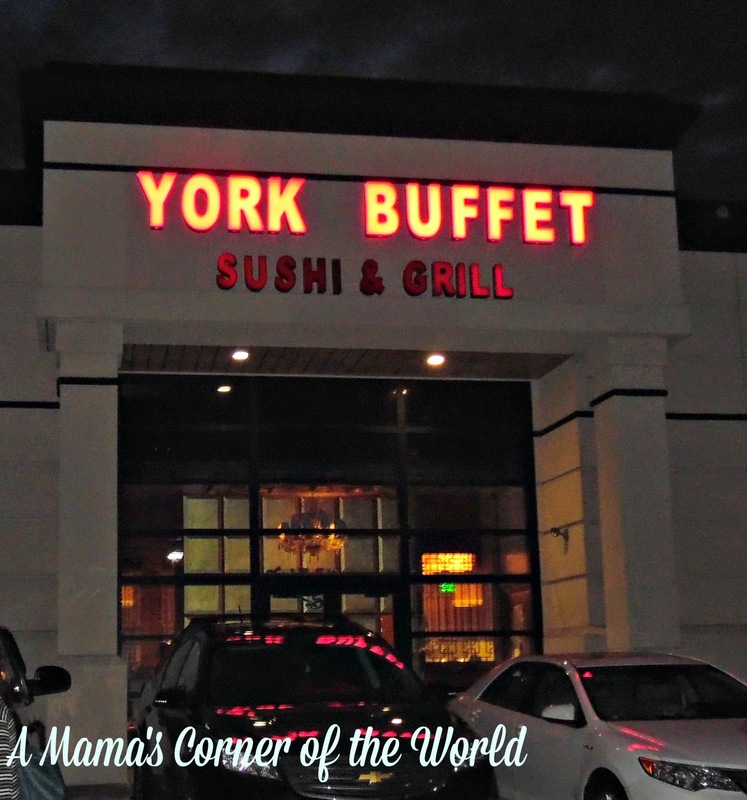 After driving around the area near the Robinson Mall surveying the food options--we spotted the York Buffet in a fairly busy strip mall. The parking lot was pretty full--but, we arrived a bit early for the dinner rush; so the York Buffet had a lot of open seating--and full buffet bars. While some of the eatery's decor has a rich, Asian feel--the atmosphere is quickly downplayed by well-worn seating, dated tabletops and napkin dispensers loaded with cheap, non-absorbent napkins. The area was large enough so that most of the tables were away from the buffet area. The arrangement made me happy as my primary complaint about buffets is that I hate wandering around tables repeatedly (or having people wandering around me!) while dining. The service at York Buffet was attentive--yet limited. Empty plates disappeared quickly, and drinks constantly seemed full. Questions; however, either went misunderstood or ignored by the servers. At times, I felt that there was a language barrier--at other times, I felt like there was a personality barrier. Luckily--it was a buffet, so there was little need for interaction or servers beyond cleanup and drink refills. York Buffet offered a little bit of everything. The buffet bars remained stocked fairly well during our visit. Several workers carried hot pans about, restocking low dishes. Dishes such as Baby Clams with Black Bean Sauce and a Crab Parmigiana emptied quickly. The ribs and the prime rib were both very good. The prime rib and the leg of lamb were both available as "serve yourself"--so both were a little mangled and improperly cut--but, the prime rib was still tender and flavorful. A bar of fried, "American" foods served to appease our middle one with chicken tenders, chicken wings, pizza, fries, and fried cinnamon donuts. 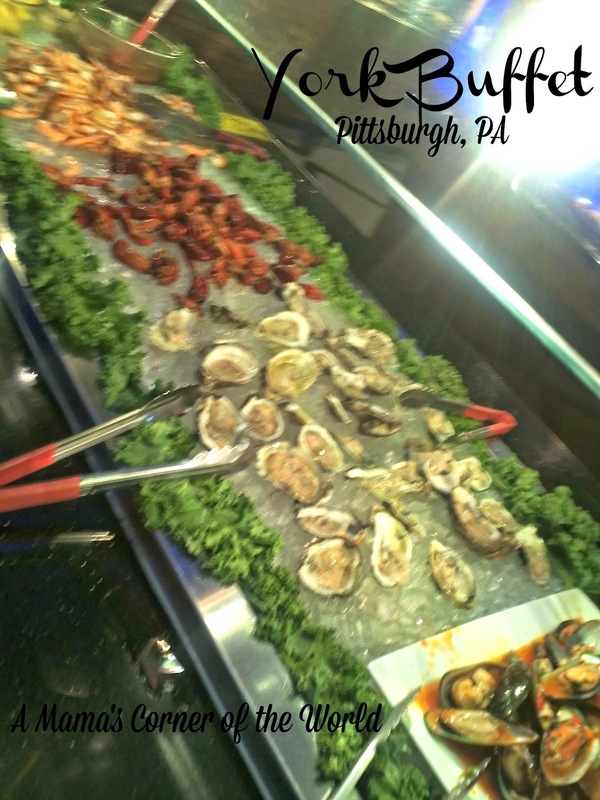 The seafood bar held everything from crawfish and mussels to crab and frog legs. The sushi bar plates held a few pieces at a time--and the "good" ones emptied quickly. The offerings were similar to the fresh sushi bars in many grocery stores--nothing fancy or overly done. We were little disappointed that the grill station where guests could choose meats/vegetables/and sauces for an entree was not operating during our visit. The dessert bar was disappointing. I didn't realize that I hadn't bothered to take a picture of it until I sat down to write this post. The kids liked the ice cream--but, I wouldn't waste the calories on the cakes, cookies or desserts. We did like the fried, cinnamon sugared donuts from the fried hot bar--so I would probably skip the dessert trays and have one of those instead next time! 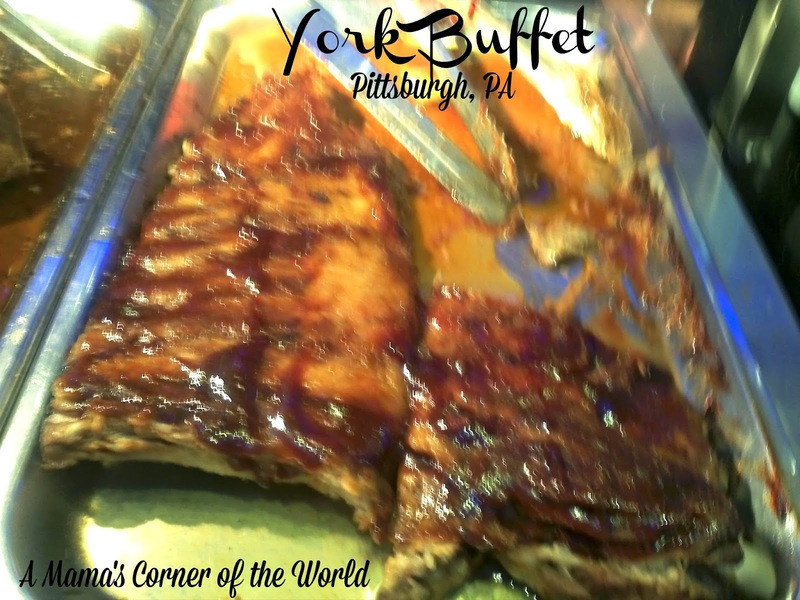 Final thoughts about York Buffet? All in all--everything was good. There wasn't any truly outstanding, "I HAVE to eat there again for the XYZ" dishes. Everything was hot and a little better than average buffet food. I would eat at York Buffet again. It was an easy way to satisfy everyone in the family for dinner--and break slightly away from the beaten path of chain restaurants. Pricing varies depending on the day of the week--and whether you visit for lunch or dinner--and they do not serve alcohol. We paid $15.99 per adult--and the girls were discounted by age to $7.99 each. Nothing special or extraordinary--just a nice dinner. We would return for dinner. Disclosure: We were not compensated for this post. this was my second time here and i left with a full stomach will continue to patronize this establishment.i was not disappointed .